Every year Small Business Week draws national attention to a sector of the economy that can often be overshadowed by the likes of Coca-Cola, Nike, Apple, or other mega-corps. But at Ooma, we regularly hear from small businesses, entrepreneurs, startups, and family firms that have chosen Ooma Office phone service as the best way to connect with their customers. In a write up about Small Business Week, technology journalist Marc Saltzman has highlighted Ooma Office as one of the top “tech tools and services to help small businesses grow by boosting productivity in the office or on the go.” Here are some of the reasons that Saltzman says Ooma is a great choice for small businesses. Small businesses that spend less time dealing with their infrastructure and operations have more time to focus on their business’s core mission. That’s why Saltzman highlighted how easy Ooma’s plug and play setup is. When Saltzman calls Ooma the “most reliable business phone,” it sounds like he’s using strong marketing language. However, there’s data to back up his claim. In PC Mag’s 2018 Business Choice Survey, Ooma Office was chosen as the #1 overall VoIP business phone service, and was the most reliable phone service of all that were surveyed. This top-tier ranking is not a fluke. In fact, Ooma Office has been named as the #1 VoIP business phone for the past five years in a row. Noting that Ooma Office provides more than 35 advanced calling features, Saltzman in particular called out the virtual receptionist tool that many of our customers rave about. It’s a way to automate your telephone answering process so that callers can be routed to the right extension. We’ve heard from small business owners that one of the benefits of using Ooma’s virtual receptionist is that it feels like adding an additional staff member. Want to be able to access your work phone from anywhere? It’s possible with the our free calling app. The Ooma Office app gives you all of the same functionality on your cellular device as you have on your desk phone. So not only will you be able to take work calls when you’re on the go, but you won’t have to give out your personal phone number to do so. Additionally, the app is a great way to provide phone service for remote employees or a distributed workforce. From delivery drivers to off-site accounting staff, the app keeps all business calls streamlined through your company’s phone system. There are a lot of unknowns when running a small business. That’s why Saltzman highlighted Ooma’s no contracts policy which allows companies the freedom to purchase phone service as needed, without any plan tiers or long-term commitments. Want the security of knowing exactly how much your phone service will cost each month? With Ooma Office, you’ll always pay the same amount, even during those months when you had a cold-calling blitz to drive up business. Ooma Office’s all-in-one price is just $19.95 per month per user, and it includes unlimited calling in the U.S. and Canada as well as anytime access to 35+ advanced calling features. 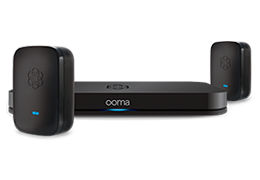 There is a one-time initial hardware cost, and our starter package of the Ooma Office Base Station with two included Linx remote adapters currently sells for $199.99. By our estimates, small businesses with three users save a total of $6,185 over three years after switching to Ooma Office. 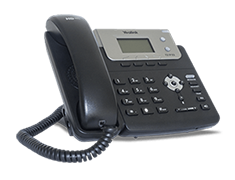 Many business customers also upgrade their phone hardware from their old analog phone to an IP phone like the Yealink T23G. Depending on the IP phone that you choose, you can access additional telephone functionality like our patented HD Voice for unpresented audio quality, one-touch three way conferencing, and call transfer options for a 1-step blind transfer or a 2-step supervised transfer. Learn more about Ooma Office phone service to see how it can help your small business.